LAUNCH CRP423 is designed to identify and solve issues related to the engine, airbag, AT, and ABS. It is known to work quickly and provide reliable solutions. This scan tool is among the few to support not only 1996 and newer obd2 models but a few obd1 vehicles as well. 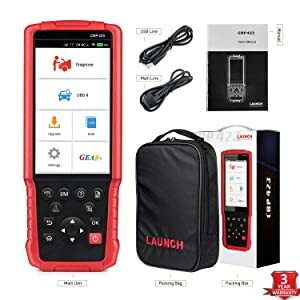 Launch CRP423 offers a mix of advanced and basic features such as smog inspection, the freeze frame, read and clear CEL, etc.., which help you diagnose ABS and SRS related issues in your car. 1.5 Who Should Take Launch CRP423? LAUNCH X431 CRP423 is loaded with more than 3000 generic code definitions that make it possible for everyone to run the diagnosis. Apart from reading and clearing ABS/SRS codes, it can read and clear CEL, MIL codes, identify a vehicle using auto-VIN, and clear DTCs, too. Launch X431 CRP423 offers real-time diagnosis and shows live data. You can perform tests to determine issues in the O2 and A/F system and also conduct a few advanced tests on the EVAP, catalytic converter. Launch X431 CRP423 is a scan tool with powerful functions. The scanner can read ABS related codes such as malfunctioned sensors, bad wires. Once you fix the issue, the scanner will clear the code upon your request. Some of the most common ABS problems include the blown fuse, low fluid level or mix-up in the hydraulic pump. This scan tool can detect and solve such troubles. Learning about the codes displayed by the scanner is a breeze thanks to the built-in extensive DTC library that offers more than 3000 generic OBDII codes. Hence, you will not have to surf the Internet to find the definition. Launch CRP423 can diagnose the airbag system and display SRS codes on the screen along with an explanation. Launch CRP423 is among the few scanners that support both OBD2 and EOBD automobiles. OBD2 vehicles are those manufactured after 1996 while EOBD vehicles contain the European onboard system. They include both petrol and diesel cars. 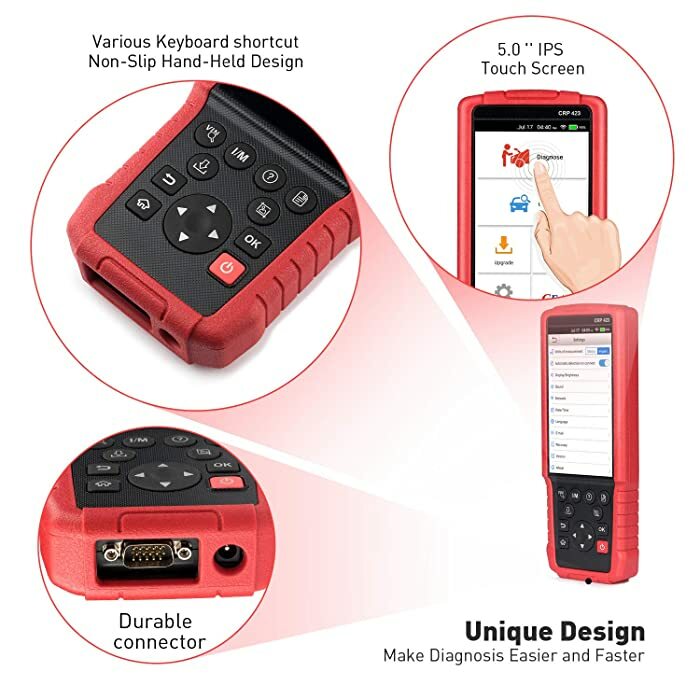 You do not have to worry about connecting the scanner to run a diagnosis thanks to its auto-diagnosis feature. It makes the whole process easier and even prepares and emails diagnostic reports. You can share these reports with others to get their opinions on car-related issues. However, some older cars that are OBD1 compliant might not allow auto diagnosis. Worry not; you can run a manual function in such cases. It will help you read and clear DTCs, stream live data, etc. 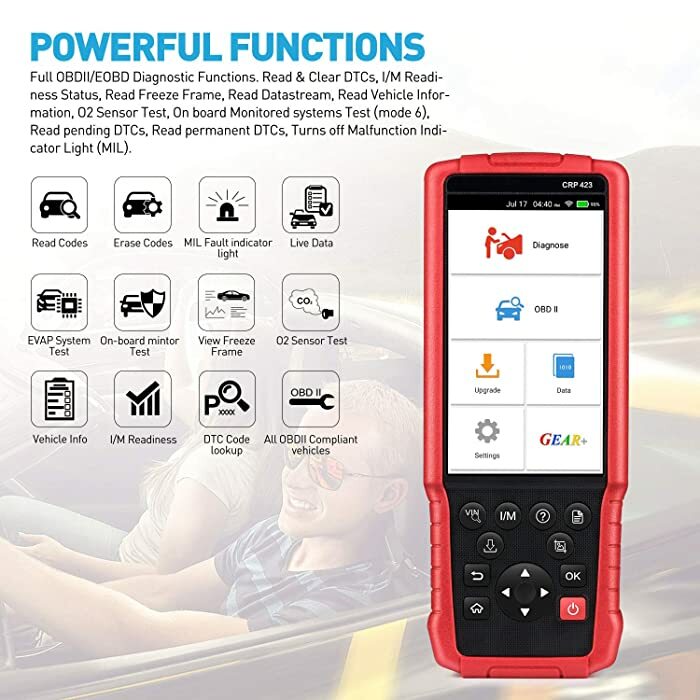 This scanner offers all 10 OBD2 test modes. You’ll be able to perform Evap test, o2 sensor test, I/M readiness, MIL status, onboard monitor tests, auto-VIN, etc. The DTC library contains valuable information that allows even new users to solve problems without any trouble. The explanations are reliable and written in simple words. With this feature, you can solve problems right there and then. The scanner is capable of displaying battery information. It will help you determine if the scanner and other accessories are receiving enough voltage or not. The A5 quad-core processor of the device ensures you do not have to face lags or freezes as you work. The 5-inch screen comes with an IPS touch feature that makes it a breeze to perform tasks. You won’t have to stroke buttons to navigate menus. Plus, the smart screen makes it easy to read what’s displayed. With the simple design, Launch X431 CRP423 is convenient for user or DIY’er to check car’s problem. It works on a 4000 mAh battery that is meant to run for hours. It is self-charging, so you won’t have to buy any charging adapter either. LAUNCH X431 CRP423 has a one-click update button that checks and downloads updates automatically. It only needs an Internet connection to work. It supports more than 10,000 brands as it’s both obd1 and obd2 compliant. Fast operations thanks to the A5 processor. One click update, screenshot, and diagnostic report. Doesn’t support ABS bleed function. Who Should Take Launch CRP423? Launch X431 CRP423 is ideal for DIYers, mechanics, and professionals. 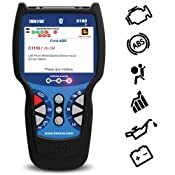 It offers ABS/SRS reading/clearing code option and supports both obd1 and obd2 automobiles. If you want to diagnose ABS and SRS related issues in your car, then consider getting Launch CRP423. It offers a mix of advanced and basic features such as smog inspection, the freeze frame, read and clear CEL, etc. You will need to plug it into the obd2 or obd1 port of your car. If it’s an obd2 compliant vehicle (1996 or newer), an automatic diagnosis will begin thanks to the auto-VIN feature. If it’s an older model that has an obd1 system, then you will need to run the diagnostics manually. Do I need to register on the website to upgrade the software? You can update the software without having to register first. Click on the one-click update, and if there’s a newer version available, it will update automatically (make sure the Internet connection is stable). What other languages does it offer? It supports German, Spanish, Portuguese, French, Russian and Japanese. The scanner is highly durable thanks to its rubber casing that protects it from impacts and scratches. Is the scanner too heavy? No, it is not. It weighs less than 3 pounds; hence it is easy to operate. You can keep it in your hand or lap without any trouble.